Fannie Hopkins Allen was born in Riverside to Starling Simon (SS Hopkins) and Hester Lugenia Davis. Fannie’s father was one of the charter members of the Second Baptist Church, organized in 1890. 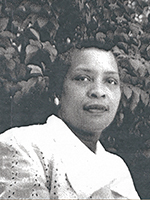 Fannie, who throughout her life referred to herself as Frances, was very active in Park Avenue Baptist Church. She put on pageants at Easter and Christmas. She directed special programs for Mother’s Day, Father’s Day and Children’s Day. At the Community Settlement House, she had May Day celebrations with a maypole. In 1940 she organized the Sub-Debs, a social club for teenage girls where she taught the social graces and parliamentary procedures. Under her direction the members of the Junior NAACP established the Inter Cultural Scholarship Fund. Her last great achievement was organizing and putting together the Old-Timers Reunion Picnic in 1976 that continues to the present.